Falooda or Faluda is a popular beverage in the Indian subcontinent made primarily by mixing rose syrup with vermicelli and tapioca seeds along with either milk or water. In addition to these basic ingredients, basil seeds (sabja/takmaria), tutti frutti, sugar, and ice cream may be added. The vermicelli used is often made from arrowroot or cornflour rather than wheat. The rose syrup may be substituted with another flavored base to produce kesar (saffron), mango, chocolate, and fig Falooda. Falooda is thought to be an adaption of the Persian dessert Faloodeh and was brought to the surrounding Middle Eastern countries and South Asia by Muslim travelers and merchants. Falooda is a popular summer drink throughout North India, Pakistan, Sri Lanka, Myanmar, and Middle East countries and is readily available in hotels and on beach stalls. 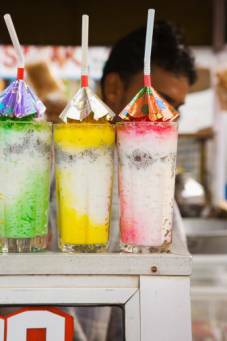 A variant is Falooda Kulfi, where Falooda and Kulfi are served together with a syrup. You will need tall drinking glasses. In a tall glass pour in about 1" of Sharbat (Rose Syrup/Sherbet), then about 2 heaping tablespoons of Nishashto, pour in a little milk, to taste, 1/2 teaspoon of Tukmaria seeds and top with a large scoop of vanilla ice-cream. YUM OMG THIS WAS AMAZING RECOMMENDED TO ANYONE AND EVERYONE!!!!!!!!! !